I have more than just a homemade pie spice mix recipes, check out more recipes at the end of the page. Combine all ingredients for desired mix and blend well. Store in a small, airtight container. Feel free to experiment with amounts to get a blend that works for you. 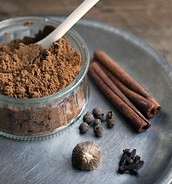 *If using freshly ground nutmeg, you might want to cut back a little bit because the flavor can be quite strong. Since you’re going to be storing the mix anyway, it is not crucial to use freshly ground here. I personally find it to be a bit overwhelming if there is a ton of nutmeg in something. One of my easy apple pie recipes include this gem. Wait till you taste it with homemade pie spice mix. CRUST:In a bowl, combine flour and salt; cut in shortening. Gradually add the cold water 1 tablespoon at a time tossing with a fork until it forms a ball. Chill dough for 30 minutes. PREHEAT oven to 425 degrees, and you will need a 9" pie plate. On a floured surface, roll out 1/2 of the dough into a 10 inch circle. Place into your pie pan. In a bowl, toss apples with lemon juice. Combine sugar, flour, cinnamon, salt and nutmeg - add the apples and toss together. 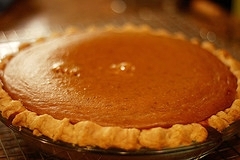 Pour into the pie crust and dot with butter. Roll out the other 1/2 of the dough for the top of the pie and cut slits in the top. Place over filling, seal and flute edges. Beat egg yolk and water and brush over pastry. Bake for 15 minutes. Then lower the oven temperature to 350 degrees and bake for another 40-45 minutes or until the apples are cooked and tender, and the crust is golden brown. *As I said above, if using freshly ground nutmeg, you might want to cut back a little bit because the flavor can be quite strong. Bake another 45 minutes or until an inserted knife comes out clean. And so much better with the homemade pie spice mix.